Top-end performance with low-end B pilot demand (EN/LTF B). Nova: "The production of the PHANTOM is extremely difficult and producing one PHANTOM takes as much time as producing three ION4s!" At NOVA we asked ourselves what a low-end EN B would look like if it was constructed without being restricted by technical complexity. The result is the PHANTOM. The PHANTOM is a new, completely revolutionary paraglider – with a similar aspect-ratio to the ION and with 99 cells, it combines the safety of the ION series with high-level performance. Exceptional directional stability as well as unique precision and simplicity underpin the excellent handling. With 99 cells, 804 needle-eye ribs and 3200 slots in the profiles and diagonal ribs to reduce weight, the PHANTOM could be the most complex and technically elaborate wing ever made. With more than 3000 individual components, it sets a new benchmark in paraglider construction. The PHANTOM is mainly constructed using 27 gram sail cloth. Combined with the weight-optimised inner construction, the size S wing weighs less than 5 kg. Little weight and low aspect ratio result in maximum safety. Never before has so much performance been so easy to fly. The PHANTOM is a paraglider in a brand-new class and therefore is suitable for a very wide range of pilots. Thanks to its high degree of passive safety and its outstanding performance, it is suitable for ambitious recreational pilots, as well as keen cross-country pilots. The PHANTOM combines the advantages of a low-end EN B wing with the performance of a high-end paraglider. If you are unsure, your NOVA dealer will be happy to advise on any aspect of the PHANTOM! The PHANTOM combines the best of both worlds: the low piloting demands of the ION and the great performance of the TRITON. Are wings with many cells difficult to fly? No, this is a misguided belief. A higher number of cells increases glider weight, but by using lightweight materials and structurally analysed and optimised slots, we could compensate for this additional weight. But performance wings with many cells are more challenging to fly than EN A gliders with few cells. Correct, but this is due to the higher aspect ratio, rather than the increased number of cells. There is no direct correlation between the number of cells and how demanding a wing is to fly. How does a large number of cells increase performance? The more cells, the smoother the wing – which means less drag. A large number of cells also provides ultimate stability. This helps maintain performance even in turbulent air. Didn’t NOVA produce a wing called the PHANTOM in the past? Correct, in 1991. 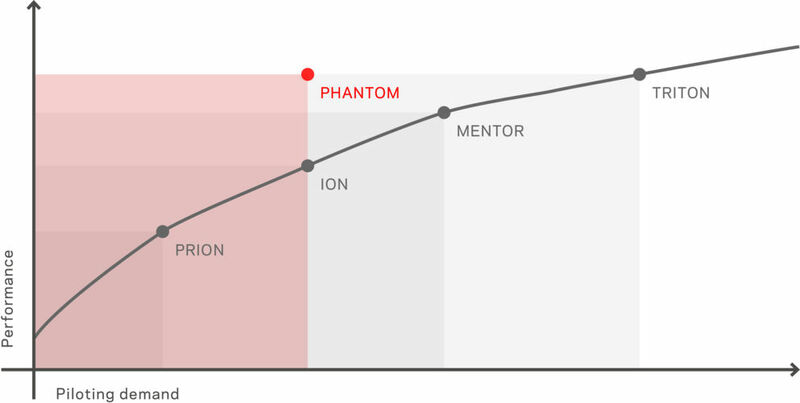 The similarity with the original PHANTOM is the increase in performance which was then, and now, impressive. Not a gram of unnecessary weight combined with the highest possible technical complexity: up to twelve diagonal strips transfer the load on every line attachment point to its neighbouring profile rib. This allows a homogenous force distribution throughout the wing. Rigorous strength analysis determined the positioning of the slots and these have reduced the weight of the PHANTOM S to less than 5kg, which makes it suitable for hike & fly. Anyone who tries to fold a piece of paper around a ball will notice that there are always creases. 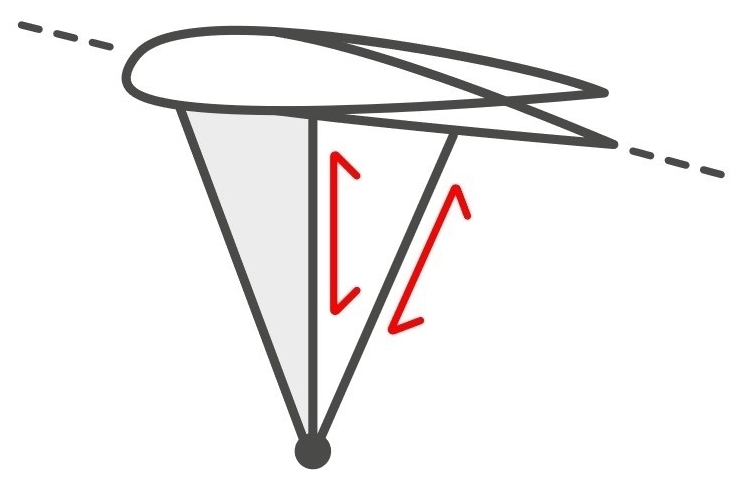 The nose profile of a paraglider is the same - the sail cloth has to adjust to both the profile and ballooning effect (cells are round, not straight). Double 3D Shaping uses additional seams to reduce creasing and therefore increases the performance of the wing. The aspect ratio of a glider is not the only factor in passive safety, but still a very important one. A high aspect ratio favours cravats after asymmetric collapses, generally shortens brake travel and normally makes wings more difficult to fly. Nova's analytical tools permit us to build performance wings even with a low or moderate aspect ratio. Needle-eye Ribs are innovative ribs which traverse the profile through slots. This results in a more precise shape than is achieved in a conventional four or five piece rib, which is implemented using multiple-piece diagonal ribs, each sewn onto the cell walls. The consequence is a more rigid aerofoil and higher performance. NOVA Rucksack.The wing and harness will determine the size of the rucksack. We are offering our high quality and comfortable to carry models in S (110 litres), M (145 litres) and L (165 litres). According to the DGAC (France), the PHANTOM will be registered for powered flight. The glider is suitable for both free flying and paramotoring. You can find the certification documents in the Downloads section. Especially for powered flight, we have developed a riser with two mounts. It is suitable for two different hook-in heights. Thank you Nancy and Carlo at Flybubble, the Nova Phantom just works so well. Being able to stay with the experienced boys or even above them is great. The Phantom is a B wing that thinks its a D, out-performing many! Thanks to Nancy Elliott and Carlo Borsattino at Flybubble for super equipment and especially service."